Earlier this year, Adam Abraham, a researcher, videographer and advocate for natural and safe healing modalities, green energy solutions and other related topics, came to Spokane for business relating to his water research. We had already connected in the past so this was a great opportunity to introduce him to a lot of the movers and shakers in the local area who are known in the “free energy” world. He met with John Bedini, Peter Lindemann, Paul Babcock and even stopped by to visit Eric Dollard on his way back down to Arizona. Here are two videos that he posted on YouTube and there are more to come. 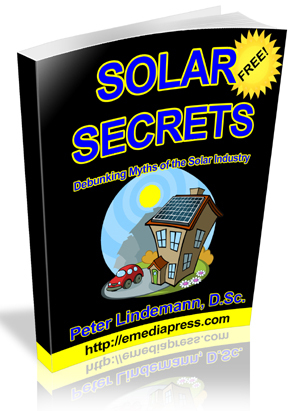 The first is an interview with Peter Lindemann on what is Free Energy and the second is a brief overview of what we do at Tesla Chargers. Please give Adam’s videos a thumbs up to show your support and share this post with your friends! Here is an invitation only call to answer questions about the Bedini SG books. Only those who have the books were invited to the call. We just made the video public so even if you don’t have the books, you can learn a bit more about the Bedini SG. For years, the “Lithium Ion” battery has dominated the market whenever high capacity, small size and low weight were application requirements. That means, they have been used exclusively in cell phones, Tablet computers, Laptops, and most of the new high capacity portable tools. But that is not all. They are also used in the newer Hybrid electric automobiles and even the latest transcontinental commercial airliners, like the Boeing 787 Dreamliner. Although these batteries have a very high energy density for their size and weight, they can also be dangerous if they are not charged properly. You may recall some of the stories in the last few years about laptop computers bursting into flames, and even the whole fleet of 787 airliners being grounded because of battery fires. So, behind the scenes, the battery industry has been trying to develop a battery that has all of the benefits of Lithium Ion batteries, but none of the dangers. Over the last two years, a new type of Lithium battery has been quietly showing up on the market. In the last 6 months, this battery has started becoming available in almost all sizes and for almost all applications. This battery is called the Lithium Iron Phosphate battery, and is referred to as the LiFePO4 for short. This new kid on the block, has a slightly lower energy density than the typical “Lithium Ion” batteries (about 14% less), but they are much safer to use than either Lithium Ion or even the standard Lead Acid batteries are. The cost of the LiFePO4 batteries are still fairly high, but the prices are coming down pretty fast at this point. 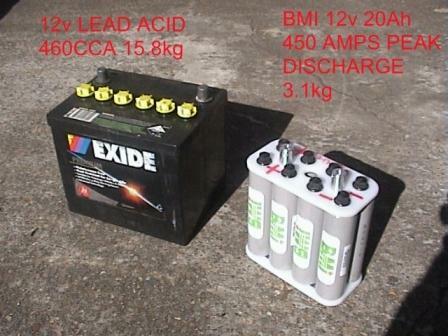 Here’s a picture of a Lead Acid battery used to start a car next to its equivalent battery in the LiFePO4 chemistry. You can see from this that the battery is about half the size and only one fifth the weight. Now THAT is a better battery! But the best thing about these batteries is their safety. The LiFePO4 battery doesn’t have a liquid electrolyte, so it can’t leak or boil out to make a mess, and you never need to add water. It can be charged quickly without harming the battery, so it won’t over-heat. And best of all, there is NO FIRE DANGER like with the more common types of Lithium Ion batteries. In fact, you may have already been using these LiFePO4 batteries and didn’t even know it. Many of the solar yard lights sold in the last year actually use these batteries. They get charged throughout the day and when it gets dark, the light comes on and runs the light until the battery goes completely dead! In the morning, the process starts over. And, this is done day after day after day for months and the battery still seems to be working fine. That is one of the biggest benefits of these new LiFePO4 batteries – they can take a serious beating and still come back over and over! There isn’t another type of battery out there that can take this kind of treatment. Any other battery, such as a sealed lead acid type, would be on its death bed if it took that kind of abuse. The LiFePO4 batteries also have a much higher life cycle rating than lead acids or the common “Lithium Ion” batteries. That means you can charge and discharge them many more times. The LiFePO4 batteries are also a constant voltage battery. For example, with a lead acid battery, as you power a load, the voltage goes down little by little until it takes a nose dive. With the LiFePO4, you pretty much get the full voltage as you’re powering a load with them for nearly the entire time and then suddenly, they drop off a cliff. This is much more desirable because you get full power for most of the capacity of the battery, which you won’t get with lead acid batteries. If you were in an emergency situation and needed a power supply for some light, a radio, a mobile phone charger, etc… what kind of battery would you want? There definitely is no comparison – the only kind of battery to have on hand in an emergency situation is a LiFePO4, no contest. As you may have heard, Tesla Motors is creating a $5 Billion factory to mass produce “Lithium Ion” battery banks in order to make the mass production of electric cars a reality. The goal is to have a 200 miles range for the battery bank, which will actually be made by Panasonic. If they produced a Lithium Iron Phosphate battery as an option, the cars would have a 172 mile range, but the batteries would last much longer and they would be environmentally friendly. Also, this could drastically reduce the cost of Lithium Iron Phosphate batteries, which would revolutionize the entire battery industry, not just for automobile applications, but also for back up battery banks in solar applications as well. For quite a while now, John Bedini, a world-renown expert in battery charging technologies has manufactured the most effective chargers and rejuvenators for lead acid batteries commercially available to the public. These chargers have been shown to be able to bring about 80% of the batteries doomed for the dump back to many more years of useful service. Unfortunately, these charging and rejuvenation technologies were never compatible with the common “Lithium Ion” batteries, primarily because of the problems in the battery itself. Fortunately, John Bedini has created a small line of solar charge controllers made specifically for the new LiFePO4 batteries. That means that the ultimate in small-scale emergency solar systems are now available, which completely surpass any other similar sized solar energy system. 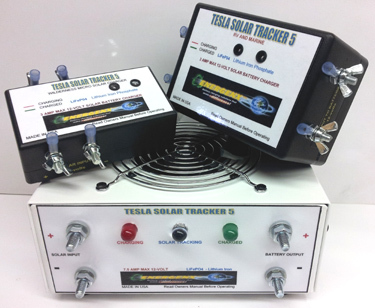 This new line of chargers is part of Tesla Chargers solar charge controller line known as the Tesla Solar Tracker 5’s. The LiFePO4 solar charge controllers are rated for 12 volt 3 amp and 12 volt 7.5 amp solar arrays. That is roughly 45 watts and 110 watts of solar panels respectively.